I mean, the title says it all really. Is your mouth watering? Because mine certainly does every time I hear the words fudgy and brownies together in one sentence! If my attempt at explaining a brownie didn’t quite make sense to you, don’t worry. It probably didn’t make sense to many people haha, which is exactly why I do food photography! They help to visualise my description attempts. 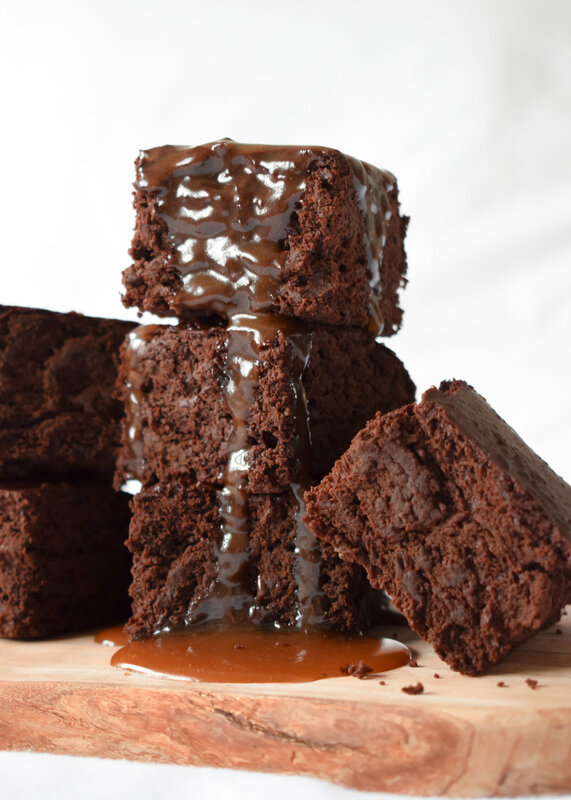 Have a look through the photos below, and if this is your kind of brownie (I personally love them!) then keep on scrolling to the recipe! Side note: these are extra fantastic warmed up and served with some ice cream as well as caramel. 1. Pre-heat your oven to 180C (fan) and line an 8x8” baking tin with foil or grease-proof paper. 2. If you haven’t already, make the flax egg and set aside in a small bowl to thicken. 3. Sieve all of the dry ingredients excluding the chocolate into a bowl. Add in the finely chopped chocolate and combine everything fully. 4. In a separate bowl, combine all of the wet ingredients excluding the flax egg, and stir until the coconut oil and sugar have melted and dissolved, and there are no lumps. The margarine and water won’t fully combine into one liquid, so don’t keep stirring expecting this to happen. The melted oil will most likely ‘sit’ on top of the water. 5. Pour the wet mixture into the dry mixture, add in the flax egg and combine everything with a wooden spoon thoroughly. 6. Pour the brownie mix into the lined tin, and bake in the oven for 13 minutes. There should be a few cracks in the top when it’s done and no visible raw mixture. 7. Leave to cool in the tin for 20 minutes, before lifting it out in the foil/baking paper and transferring it to a chopping board. Once completely cooled, peel away the foil/baking paper and cut the brownie into 16 pieces. 8. Serve warmed up, with ice cream and caramel! The caramel shown in the photos was made using Minimalist Baker’s recipe which I’d definitely recommend - it thickens up nicely overnight in the fridge too and is a beautiful golden colour. Yum! Sending love to you all, I hope you enjoy this recipe! Let me know your thoughts and show me your recreations over on Instagram.